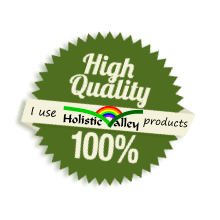 Holistic Valley is the brand name developed by Shop Holistic for a range Natural Health products and equipment. We aim to offer a wide range of natural health products at prices affordable to all without sacrificing quality. We offer many products substantially cheaper than many other suppliers who may use unnecessary fancy packaging to justify inflated prices. Our packaging is simple yet adequate, and our labelling, instructions, printing and artwork is carried out by ourselves to keep our costs to an absolute minimum. If you are a member of the public, be assured that we have developed our range with you in mind. Much of our range was sourced and introduced simply because we were not happy with the quality or prices of these products when we wanted to buy them for ourselves! If you are a health shop or practitioner, you may be interested in stocking some of our range of products. We can be quite flexible with the way we can work with our distributors to offer a range of products that allow you to profit from offering our products and still give great value to your customers. Visit www.holisticwholesale.co.uk or call us for more details. The Holistic Valley brand is trademarked. Please respect our trademark. We will actively take measures to enforce our trademark to protect our brand. Therapists who use Holistic Valley brand Products!